The M.E.S.A. was founded in 1933, by Matthew Smith, a British machinist and socialist/syndicalist who was involved in the shop steward movement in the UK. After moving into auto production in the States, Smith helped organize the M.E.S.A., pioneering the unionization of skilled autoworkers. This Collection covers 1944-1952 with various mising issues. The M.E.S.A. refused to sign the no-strike pledge and fought against CIO incursions into their organized shops. Very cool. I remember searching for information about M.E.S.A. a while ago, just out of curiosity, and I had a terrible time finding even the most basic information. 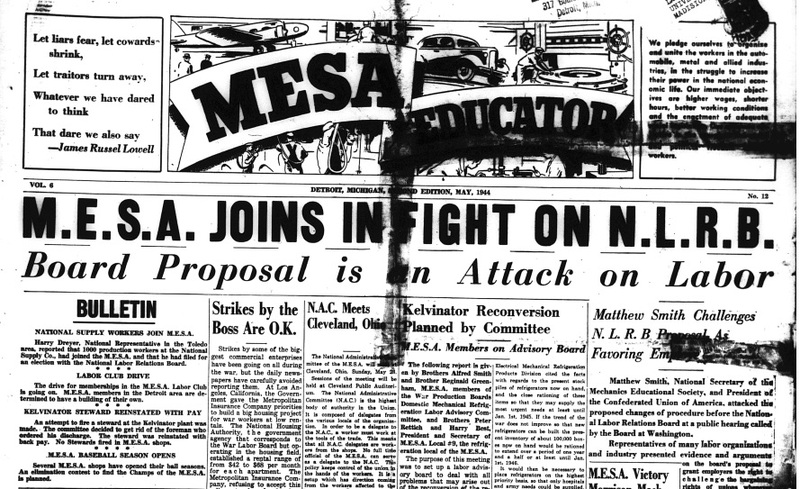 It would be cool to eventually get a brief article outlining the history of M.E.S.A. up here too, as that doesn't seem to be online anywhere. Thanks so much! I'm uploading a lot more issues right now. Look for an article outlining there history come May. Glaberman touches on them in the second half of his book on Wartime Strikes. Thanks for doing this. I've "grown up" with MESA...but never seen their paper. Sen. Ferguson. . . . Did you organize [the MESA]? Smith. No; I wouldn't say that. .. .
Sen. Ferguson. Who was really the organizer? Smith. Some very unscrupulous employers in this area must be given credit for organizing our union. . . . Any place you cannot organize, you must be patient and allow the boss to do it for you. He is usually tempted to do just that. The Chairman. Has your organization signed the nonstrike pledge? Smith. Oh my goodness no. . . .
We would not, and we don't intend to refrain from striking, as we have not as yet met any employers that are worthy of being given that pledge. I am afraid they might be tempted to touch some of our members and discriminate against them, and if they ever do that, the full weight of our organization will be used, peacetime, wartime, in season or out of season, to protect our membership. Sen. Ferguson. Do you get in the plants at all? Smith. I get in all the plants. Sen. Ferguson. Where your operations are? Sen. Ferguson. In other words, you called a strike. Sen. Ferguson. A walk-out. Then you would be able to get in with them. Smith. That is right. I mean we understand each other. We understand that we are in an unremitting economic war with the employers. They perfectly understand. Sen. Ferguson. The only people, then, you wouldn't take in are the stockholders? Smith. That is right. I don't think they live good enough lives, else we mix with all kinds of people. We draw the line somewhere. [Laughter.] . . .
Sen. Ferguson. You think most of your members think the same thing? Smith. It just depends how persuasive I have been. I don't know; I keep on being elected by giving out that philosophy. That is all I can tell you, Senator. Smith. Our production is retarded in the Detroit area from possible potential production for various reasons: No. 1, there is an acute shortage of labor during wartime. The average man and woman in the plant is not saturated and permeated with the fear of losing their jobs. That fear is not there. The substitute, of course, should be that they want to go in for all-out production because of the war effort. My members, peculiarly enough, have been conditioned from the first time they started work, to the incentive of wages. They work for wages. They don't know how to work for idealistic causes. They don't know how to work for the four, five, or six freedoms; they work for cash. I have a copy of that report in PDF it's huge. Has similar interviews with Reuther and other CIO types as well. Yeah I'll post up the gov't reports as well as some more of the Educator in the next few days! Sorry it's trickling out!